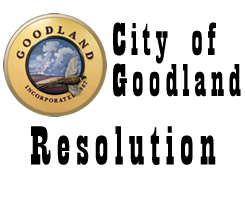 A RESOLUTION FIXING A TIME AND PLACE AND PROVIDING FOR NOTICE OF A HEARING BEFORE THE GOVERNING BODY OF THE CITY OF GOODLAND, KANSAS. All of Lots Fourteen (14), Fifteen (15) and Sixteen (16), in Block Nineteen (19) of the C K & N Addition to the City of Goodland, Sherman County, Kansas, according to the plat thereof. may appear and show cause why such structure should not be condemned as an unsafe or dangerous structure and ordered repaired or demolished. This structure may also be referred to by its property address, 418 E. 17th St.